My Aunt Louise, or “Auntie Wese” as we called her, was my father’s only sister. She was known to be pretty feisty, but to me, she was nothing but sweet and kind. I adored her and I will always remember her kitchen at holiday time, full of tins filled with wonderful cookies, candies, and caramel corn. Between her and my grandma, who lived in a little house next to her, it’s no wonder I developed such a deep appreciation of good food! When my cousin, Randi, gave me this recipe, I felt as if I’d been given a very special gift. I love to make it and think of how “tickled” Auntie Wese would be that I’m sharing it with family and friends. 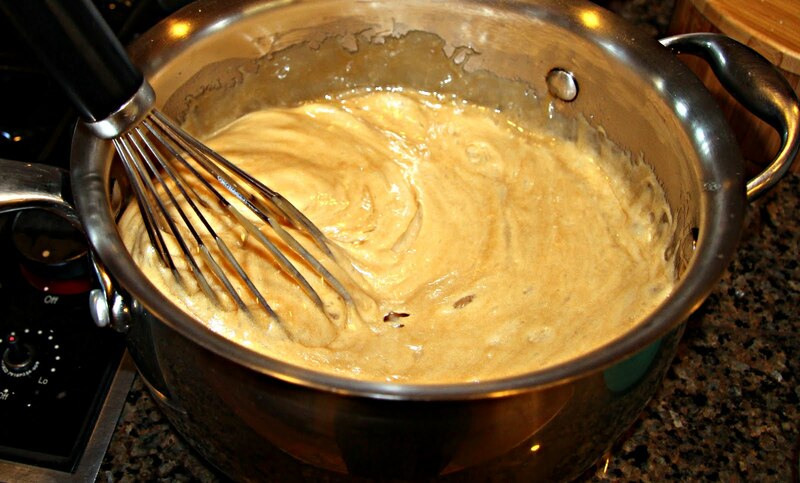 There are a couple things you need to know before you begin making this wonderful confection. First and foremost, you CAN do this. I have faith in you. Second, you need to set aside about 3 hours of your time in order to make it correctly. Don’t worry, the caramel corn spends 2 of those hours in the oven and the prep should only take 30 minutes, at most. The other 30 minutes are just in case you need them. 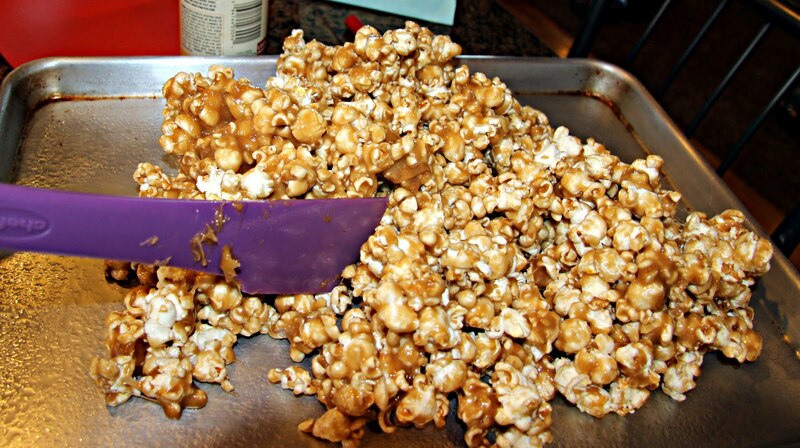 Third, once the caramel corn is finished and cooled, you will want to immediately place it in an airtight container (preferably one with a lock) or you run the risk of eating the entire batch right then and there. It’s that good. Bob and I refer to it as “crack”. Fourth, you’ll want to gather all the equipment and ingredients you need so you don’t have to run back and forth to the cupboard or the pantry. Always a good idea, but especially in this case. Assemble equipment and ingredients. Coat large bowl and half-sheet pan with cooking spray so they’re ready for action. Also, coat your spatula and the measuring cup you use for corn syrup with cooking spray. You’ll thank me later. Pop the popcorn. I use my good friend, the Whirly Pop stove-top popper, but any popper will do. It takes about 1/2 cup popcorn kernels to make 16 cups popped corn. Place the popcorn in the large bowl and set aside. 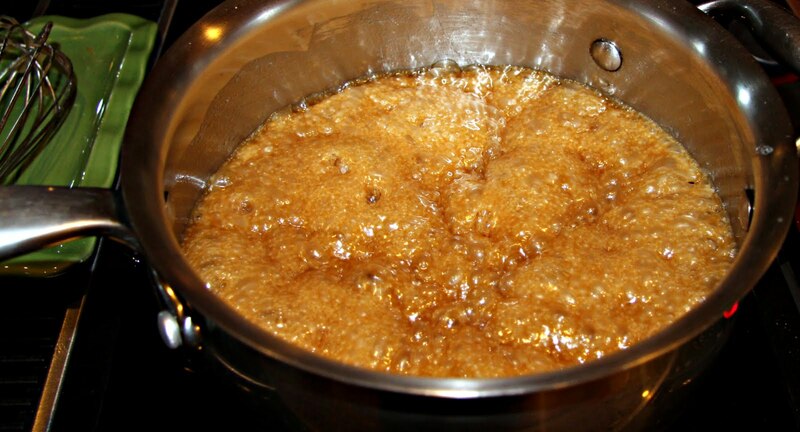 In a medium-large saucepan, combine butter, brown sugar, and Karo syrup. Cook over medium-high heat, stirring frequently until the mixture comes to a boil. Let it continue to boil over medium-high heat for 5 minutes. Remove from heat and, stirring quickly, whisk in salt, soda, cream of tartar and peanuts (I didn’t use peanuts this time because I was making it for a preschool party). 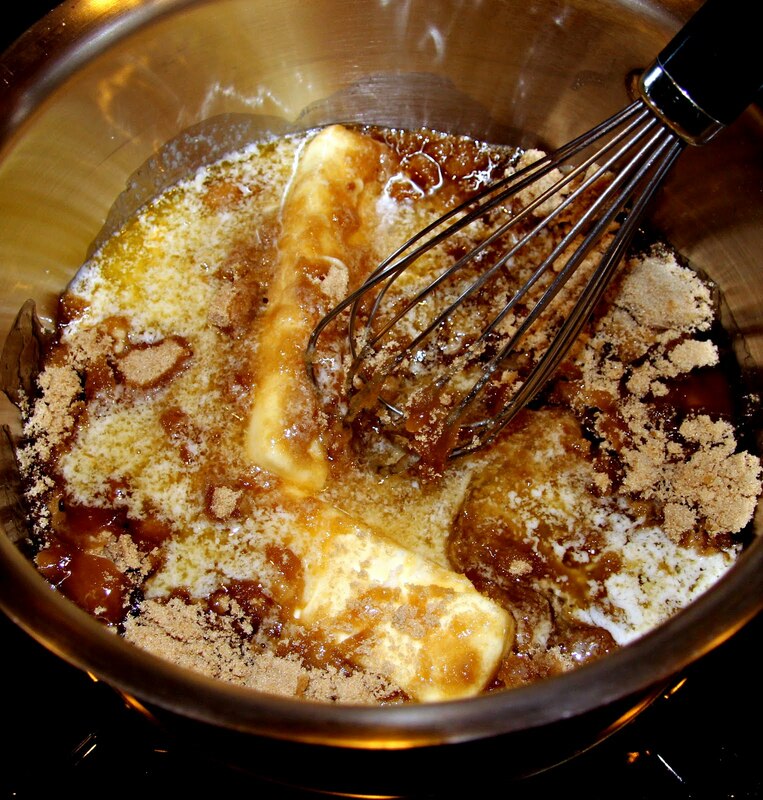 The caramel mixture will become light and foamy. 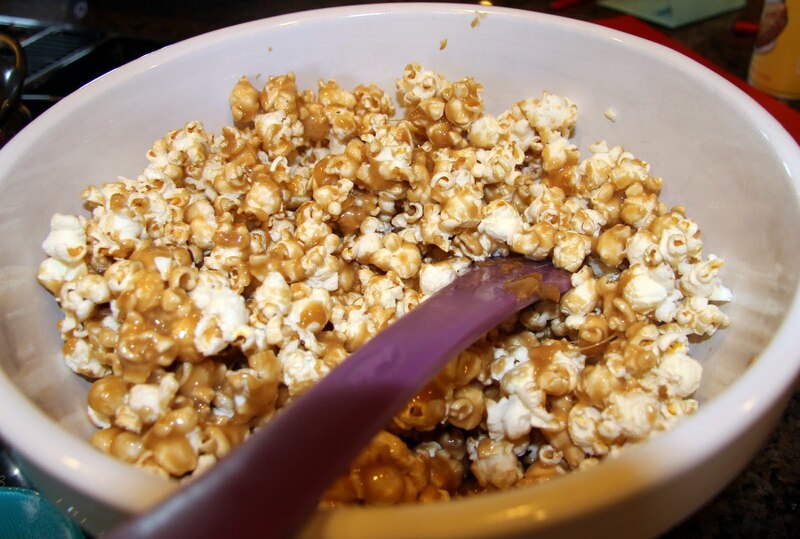 Immediately, pour the caramel over the popped corn and stir to coat. Spread on to the sheet pan and, if you like a little salt with your sweet, lightly sprinkle with coarse salt. Bake for 2 hours at 250 degrees, stirring every 15 minutes or so. This will make it wonderfully crisp! Turn it on to waxed or parchment paper, or silicone pad to cool, breaking up any large pieces at this time. Allow it to cool completely. Put it in the container quick!!! This makes a really great gift presented in a festive tin lined with parchment paper… If there’s any left.